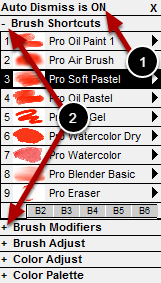 The Paint Control panels along with the Brush Control panel in TwistedBrush Pro Studio are the primary control panels used to select brushes, colors and make adjustments to the selected brush. These panels by default are docked on the left hand side of the application area, but they can be undocked or even popped up with a mouse button when the Brush tool is selected. When the Brush tool is selected a right mouse click will popup the Paint Control Panels. See the Brush Tool topic for more details. The Auto Dismiss option determines if the popup Paint Control Panels will be hidden as soon as any brush or setting is changed. Clicking on the the Auto Dismiss text will toggle the option ON and OFF. Each of the 5 panels can be expanded or reduced with the + - icon. This will be remembered for subsequent popups.